Cobblers, Crumbles & Crisps, Oh My! Fall is a wonderful time of the year to bake. The sweet & savory smells wafting from the oven makes fall one of my favorite seasons. So to celebrate the fall season, friends and I are getting together in the kitchen to bake up some cobblers, crumbles & crisps made with in season fruit, nuts and berries. BLOGGERS: Join in the fun and share a cobbler, crumble and/or crisp recipe for this blogging adventure! 1) Make a cobbler, crumble and/or crisp and create a blog post about it from now until the midnight, October 20th. 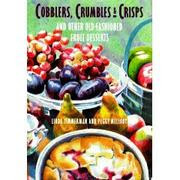 Any previous blog posts you have where you've created a cobbler, crumble and/or crisp are happily accepted. I love crumbles and crisps! They are so easy and you get more fruit and less starchy stuff. I'll get to work on a good submission. I'm baking my entry right now! It's so easy and smells so awesome. I just sent you an email with a tasty crisp I made last week.